Silver prices followed much the same pattern as for gold today, although once again in a more muted vein, with silver trading marginally higher initially only to fall back later in the session to close with a weak candle signified with an upper shadow to the main body. 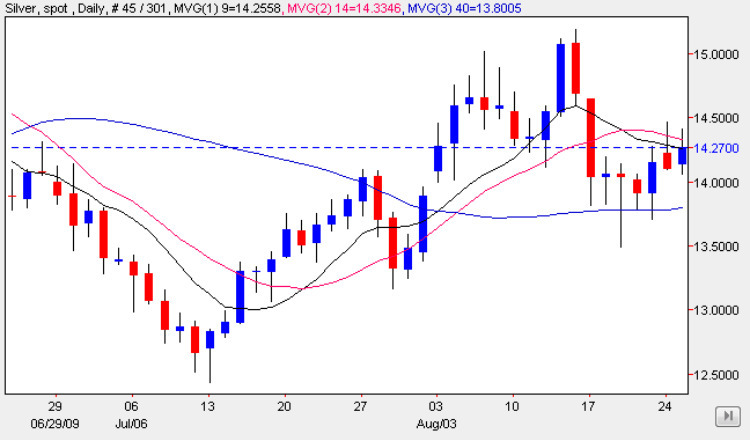 As for gold prices, silver too finished the silver trading session once again below both the 9 day and 14 day moving averages, suggesting a bearish tone to the daily silver chart, but with silver prices continuing to consolidate in the current range and with thin volumes in the silver futures market it is increasingly difficult to forecast the longer term trend with any degree of certainty. In simple terms the $12.50 and $15 per ounce price points define the current consolidation region, and until we see a sustained break above or below these levels, then any trading will be limited to intra day scalping opportunities. With the summer recess continuing and with national holidays in various countries, it seems that we may have to wait until early September, before normal service resumes when hopefully the silver market and silver trading prices will once again be re-invigorated as the markets kick back into life once again. In the meantime small intra day positions are the suggested way to trade with a bias to the short side.